What appealed to me the most about this recipe was that the ingredients were very similar to my fudge/caramel recipe. Combine all caramel ingredients in a saucepan over medium heat. Bring to a boil, stirring to melt and blend all ingredients together. Reduce heat to low and continue a slow boil; stir constantly to avoid the caramel from burning. Caramel is done when it reaches the soft ball candy stage (approximately 10 minutes at slow boil). While still hot, pour caramel over a big bowl of popcorn, mixing well to coat. Sprinkle liberally with the sea salt, again, mixing well for even coverage throughout the batch. Oh my wouldn't this be a spectacular treat to bring into work!!! This looks so very good. I so shy away from heating sugars and syrups...I am such a kitchen klutz! Really Ann...I want to come and live with you! *sigh* that looks sooooo good! This looks wonderful. I needed something sweet today! Thank you for sharing. It will be a treat. oh WOW this looks tasty!!! omg i just made a big dumb dinner, i should have come here first, this is all i need for a week! 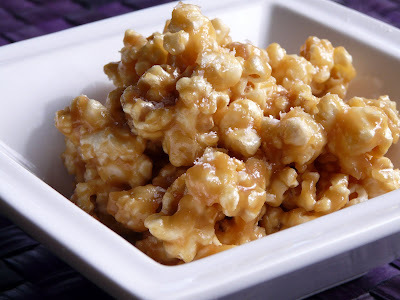 I'm a huge caramel corn fan and know I will love this recipe. I like the addition of sweetened condensed milk. I'll never be able to leave this alone. It's an honor to have you visiting my own kitchen. I'm following your blog, an drooling over every recipe. This one, in particular, catches my hungry eyes. I love caramel on just about anything. I can see my husband and I enjoying our newly empty nest, while watching a DVD and sharing a bowl of this. I LUV LUV LUV caramel corn but have never made it because til now I never saw a recipe I wanted to try. This looks SENSATIONAL!! This looks incredible and i've been thinking about it for a couple days so tonight I made it! It tastes wonderful but it's soft and sticky. Should it be that way? I thought it would harden up a bit after it cooled but it hasn't. I cooked it to 240 degrees and the only thing I changed was to use dark corn syrup rather than the regular because I ran out, so I used half of each. Monica, this is definitely a treat that needs to be eaten shortly after it is made. The caramel on the popcorn is delicious but it is not a hard caramel coating. In fact the popcorn gets soggy if it isn't eaten fairly quickly. Ah! Okay, I thought it was me. I wish I had know that and I would have made it this morning instead of last night. I have the popcorn in the oven to see if it'll toast up a bit. I'll let you know how it turns out. Thanks for responding back so quickly, I appreciate it! Monica, I actually baked a small portion of my caramel corn too to see what the difference was. It did crisp up but it made for a darker harder caramel. It wasn't to my taste. But then again I'm not really a regular caramel popcorn fan. Which is why I guess I really loved the first version. Because it was more about the caramel than the popcorn. So I put it in the oven on buttered parchment so it wouldn't stick. I put it in a 275F oven for 30 minutes, turning it half way through. It firmed up a little bit but it still had that wonderful chewy and sticky quality. I took it to a friend and we munched on it in the theater while watching Julie and Julie. Love it! Mmm, I love salted caramel. What a great idea to use it with popcorn. Would love to make this. About how much popcorn would you mix the caramel with? Anonymous, I never measured the popcorn. Just made a large bowl and tossed in the caramel sauce. If I had to guess, It was probably 5 to 6 cups of popped corn.